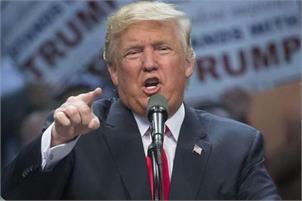 Washington, President Donald Trump said Tuesday he is “100 per cent” prepared to close down the US-Mexico border, warning Congress and Central American governments to take action to stem the flow of migrants into the country. Trump said Democrats were blocking reforms for political reasons but could fix the problem “in 45 minutes.” He was not specific, but Homeland Security Secretary Kirstjen Nielsen has asked Congress to give border officials the power to forcibly repatriate Central American illegal immigrants, including children who arrived alone, back to their countries. “The volume of vulnerable populations that’s arriving is unsustainable… The humanitarian situation cannot be ignored and the security situation cannot be ignored.” Trump said Mexican officials had reacted to his threat to close the border last week by clamping down on the caravans of migrants fleeing poverty and violence in the three Central American countries. “I think the answer is we can and people are looking at different options, particularly if you can keep those freight lanes, those truck lanes open.